Profound is inadequate to explain the message of Our Lady today. A Friend of Medjugorje has told us many times, and written throughout the years, that Our Lady is here to teach us. Not as the world thinks of education in terms of college degrees, but rather real wisdom to attain the final and highest degree, eternal life, Heaven. Our Lady uses the word decide six times in today's message: "Decide for Jesus... Decide and Set Out... Decide for Him... Decide... Decide for Peace... Decide for Prayer..." A Friend of Medjugorje has written and spoken throughout the years, that Our Lady calls us to make a decision. Are we concerned with all of the 'what ifs' of making a decision to change our life? 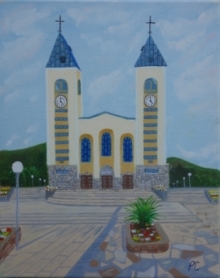 A Friend of Medjugorje tells us that the hardest part, is making the decision. After that, God gives the grace. Love, for example is a decision. Often you will not 'feel' love towards the person you are supposed to show it to, whether it be your spouse, kids, or your enemy. However, with the decision made to love, whether or not you feel like it or not, God supplies the grace. Many times throughout the years, a Friend of Medjugorje would pray in his prayers to Our Lady, that all he had was his decision to follow Her. Whatever happened, whatever the consequences of that decision was not his concern, that even when there was nothing else left to give, he still had his decision for Our Lady; so strong was his 'yes' to follow Her. So, step out into the future, make a decision to follow Our Lady and change your life, both spiritually and physically. In what way does today's message speak to you? You yourself know what Our Lady is asking of you.